Feed-in tariffs for solar generation have decreased over time, moving from providing a competitive payback over the life of the system to ensuring fair compensation for the renewable electricity supplied to the grid. 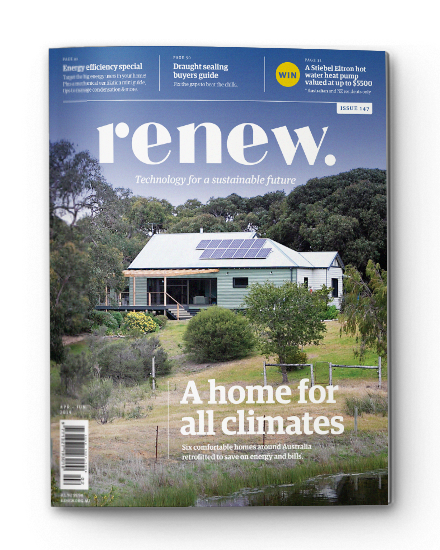 Renew’s Keiran Price explains how minimum solar feed-in tariffs are set and helps demystify an intriguing new time-of-day feed-in tariff proposed for Victoria from July 2018. 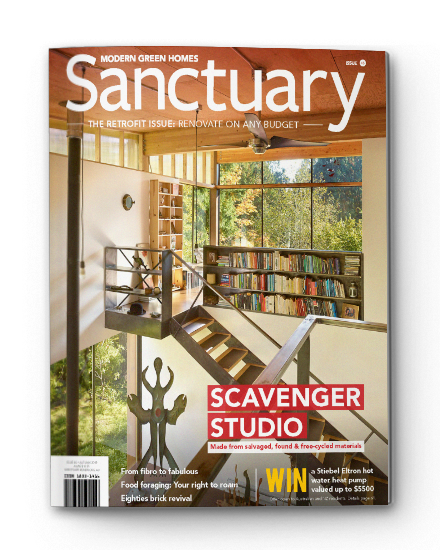 This article was first published in Issue 143 (Apr-Jun 2018) of Renew magazine. A feed-in tariff is a pretty straightforward concept—it’s the money paid to a household or business for solar electricity which they generate and export to the energy grid. Feed-in tariffs were initially designed to ensure that a home or business that installed solar (or other renewable energy generation) achieved a competitive payback over the life of the system. Nowadays, the key purpose of the feed-in tariff is to ensure that homes and businesses are fairly compensated for the renewable electricity that they provide into the grid. But that competitive payback is still there! It can be argued that Germany is the home of the feed-in tariff. They introduced the world’s first feed-in tariff specifically targeted to subsidise renewables in 2000. Since then, feed-in tariffs for renewable energy generation have been introduced in over 40 countries, including Australia in 2008 (in South Australia and Queensland). Early feed-in tariffs were designed to give certainty to renewable energy generators on the level of return that they would see on their investments. By having a fixed payment per kilowatt-hour, for a fixed period, it was easy to determine the payback time—how long it would take to earn enough money to pay for the initial investment and then start profiting—which made financing easier. The aim was to increase uptake and installation of renewable energy generation, with the multiple benefits that flow from that. Figure 1. 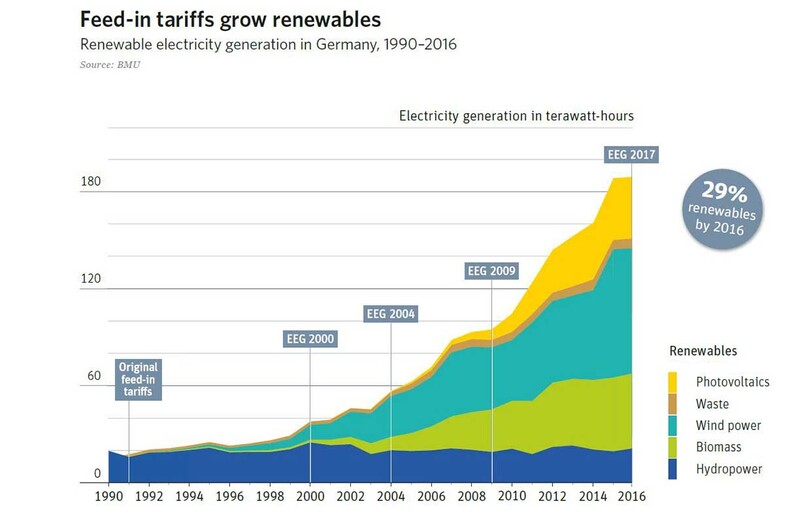 The impact of Germany’s EEG (Erneuerbare-Energien-Gesetz) feed-in tariff to subsidise renewables (from 2000 on) on the amount of renewable energy in Germany can clearly be seen. One such benefit is the reduction in greenhouse gas emissions that flows from increased renewable energy generation. This makes it easier for governments to meet targets for renewable energy. Another benefit comes from the increased demand for renewable energy technologies; this increases research and innovation in the industry, and leads to increased levels of production and cheaper products for consumers—as we’ve seen with the incredible price drops of solar technology. As the cost of installing renewable energy generation like solar has decreased, the level of support from feed-in tariff schemes has also decreased. In Germany, Australia and other countries, the feed-in tariffs provided have decreased to the point that the initial tariffs look unbelievably generous! In Germany in 2004, the feed-in tariffs guaranteed to new solar PV for a period of 20 years ranged from 45.7 to 57.4 c/kWh. By 2014 the rates had fallen to 8.9 to 12.9 c/kWh (still guaranteed for 20 years). However, at the same time the cost of installing solar PV has been decreasing by around 14% per year. Installing rooftop solar PV is now more than 75% cheaper in Germany than it was in 2006, with the cost of the solar panels themselves reducing even more. The net effect is that the ‘levelised cost of power’ for solar PV has stayed roughly the same in Germany from 2000 to now. With low solar PV prices, new purchasers of solar are getting a similar payback time and percentage return on investment, even though the feed-in paid per kWh has dropped significantly. Figure 2: From 2004 until 2010 Germany was responsible for roughly 50% of global solar PV installations. During this time the cost of installing solar PV fell drastically, and other countries such as China are now benefiting from cheap solar PV technology. 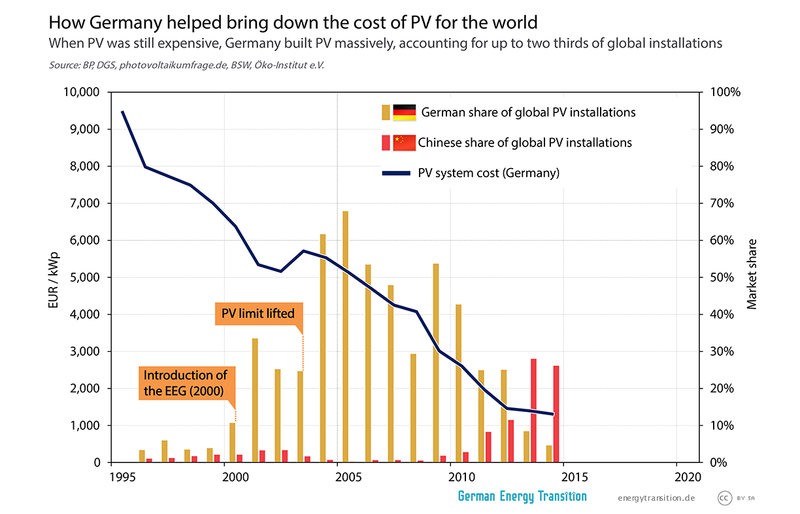 (Source: How Germany helped bring down the cost of PV). Unlike in Germany, the retail energy markets and feed-in tariffs in Australia are managed at a state level, rather than nationally. But similar to the German experience, every state and territory in Australia first introduced generous feed-in tariffs and then decreased the rates over time. 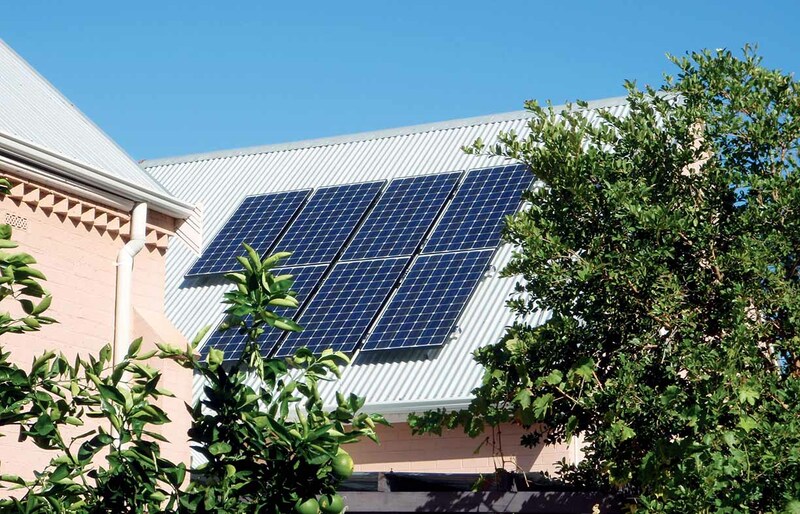 In Victoria, regional Queensland, Tasmania and the NT there is now a mandated minimum feed-in tariff, set by the government, but in SA, NSW and the ACT, there is no mandated minimum. The states that have a minimum tariff have set this in various ways. A few years ago, the Victorian government directed the Essential Services Commission—regulator of the Victorian retail energy market —to review its approach to determining the minimum feed-in tariff (FiT), to ensure it reflected as much as possible the true value of distributed energy, including social and environmental value. The commission undertook an extensive analysis, including detailed examination of smart meter and substation data, and a comprehensive consultation process. avoided market fees and transmission costs. They also recommended an annual payment based on overall system size reflecting the value of reduced carbon emissions and, for later introduction to give the retail market time to adjust, a ‘critical peak’ FiT, paying a higher feed-in tariff rate during peak wholesale price times. The Victorian government deemed this approach was too complex. They removed the location aspect from the time-varying FiT calculation and rolled the emissions reduction value into the FiT as a value per unit of feed-in rather than a separate annual payment based on system size. They also delayed for one year the introduction of time-varying FiTs. This is the process that brought us 2017’s 11.3 c Victorian FiT. 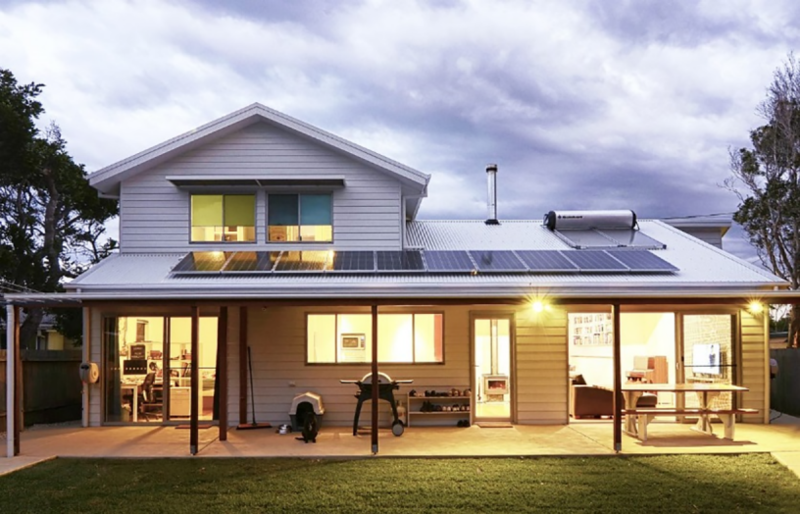 These changes meant a FiT that was less ‘value-reflective’ than the original commission proposal, but still reflected the real value of distributed generation more closely than the previous FiT (and, in Renew’s view, any other FiT in Australia). 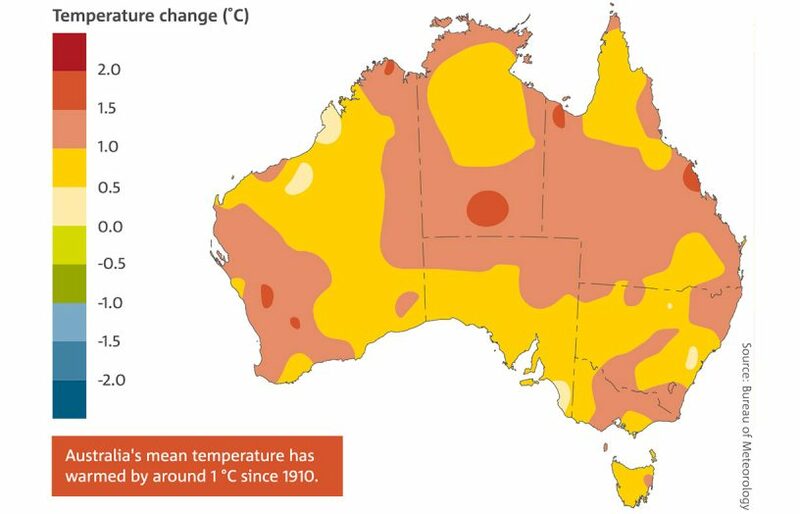 In the second half of 2017, the commission started the process of determining the Victorian FiT for 2018–19 with the aim of introducing a time-varying FiT. To work out the appropriate FiT value for different time periods, they commissioned independent analysis of the wholesale market to determine average prices for the peak, off-peak and shoulder periods, based on the same time periods used for time-of-day electricity pricing in Victoria. This was then used to calculate peak, off-peak and shoulder FiT rates. When calculating the flat-rate FiT, the commission focused on the times of day when most solar exports occur—the hours around midday. Their consultants predicted that in 2017–18, the market value of wholesale electricity during these hours will be quite low due to increased supply from a surge in solar installations. The bulk of solar exports were accordingly assigned a relatively low value, pushing the weighted average down to a relatively low flat FiT of 9.9c/kWh. Feedback from energy retailers that they might not all be ready to implement time-varying FiTs led the commission to make them optional. Retailers must offer at least one of the new FiTs—the time-varying one or the flat-rate one—at the minimum rates or higher. Further concern that retailers would be unable to implement critical peak FiTs without incurring significant expenditure led to a deferral of critical peak FiTs for another year. One of the interesting findings of the analysis of wholesale prices was that despite the average wholesale price increasing overall, the average price during the solar generation period has gone down. This is due to the huge amount of solar generation that has been added in the last year and that will be added in the next year. This includes distributed generation (small and medium rooftop PV) as well as a few grid-scale solar farms that are coming on line in the next twelve months. The effect of these is to depress the wholesale price during the day. The price then shoots up as PV generation tails off at the end of the day, while households with rooftop solar (and everybody else) are still using a lot of electricity. The alternative flat-rate minimum FiT will be 9.9 c/kWh. Is it a good result? Renew is broadly supportive of the new approach to calculating feed-in tariffs in Victoria. While it’s unfortunate for solar households when FiTs go down, setting FiTs in line with their actual value is good policy. Solar generation depressing the wholesale price of electricity is good for everyone, and an essential part of the massive transition to a 100% renewable grid that we are in the middle of. The time-varying FiT provides an opportunity for solar households to make up some of the losses on the lower shoulder rate with the high peak rate, and gives a price signal for orienting solar installations or shifting household energy consumption in order to export to the grid when it needs it most. That said, we have a few concerns. With the time-varying FiT being optional (this year), it’s likely that many retailers will only offer the flat-rate FiT because it will be cheaper for them. However, we do expect a few of the more progressive retailers to offer the time-varying one in order to attract solar households. This could then lead to other retailers offering it sooner rather than later in order to compete. We believe that the use of two-year-old solar generation data in determining the solar-weighted wholesale price, used to calculate the flat-rate FiT, has led to a lower value, due to the significant increase in the capacity of rooftop solar PV systems in the last two years. We have communicated this to the commission and we understand they are investigating the issue. The rationale for using different methodologies for calculating the flat and time-varying FiTs is not clear. Since this has led to the strange outcome where the flat rate is lower than both the shoulder and peak rate, meaning that a household will always earn less on the flat rate than on the time-varying rate, we’d like to see further explanation from the commission to avoid confusion. We have also urged the commission to accelerate introduction of the critical peak FiT in the interests of greater value reflectivity; to revisit the question of inclusion of the value of avoided health costs in the value of distributed energy; and to advocate to government for the value of the emissions reduction and health benefits to be calculated on the basis of gross generation and remunerated as an annual rebate, rather than on feed-in only. 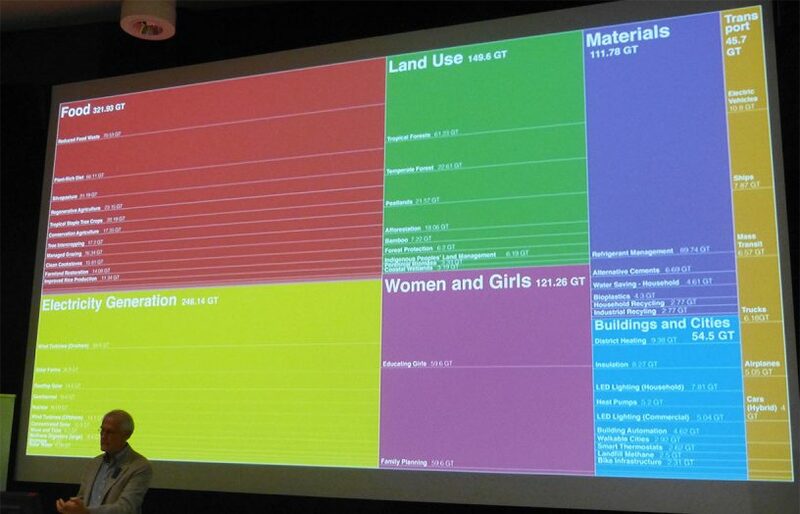 In addition, given the added complexity of time-varying FiTs, we recommended that the commission develop a tool to assist with calculating the value of a solar PV installation when using the time-varying FiT, perhaps based on the data they have already analysed on the typical feed-in patterns of solar households. Should I change retailer to one offering time-varying FiTs? At this stage, we don’t even know if any retailers will offer time-varying FiTs in 2018–19, but preliminary analysis from the ATA indicates that, where retail electricity rates remain the same, solar households in Victoria will be much better off under the time-varying FiT than they would be under the new flat FiT. This is particularly the case for homes with west-facing panels or those with low-consumption that tend to export most of their generation after 3 pm. north-east, north-west, north-facing, west or east/west PV system. From this modelling, we found that the time-varying FiT would lead to FiT payments that were between 15% and 25% higher than under the new 9.9 c/kWh flat FiT. Compared to the old flat FiT of 11.3 c/kWh, the new flat FiT of 9.9 c/kWh would decrease payments by 12%. However, the new time-varying FiT would increase payments by between 3% (for high-usage homes with north-east facing solar) to 13% (for low-usage homes with north-west facing solar) over the old flat FiT. Figure 3. How much FiT payments increase from the proposed time-varying FiTs in Victoria compared to the 9.9 c/kWh flat FiT for households with 13kWh/day electricity usage and varying solar system size and orientation. 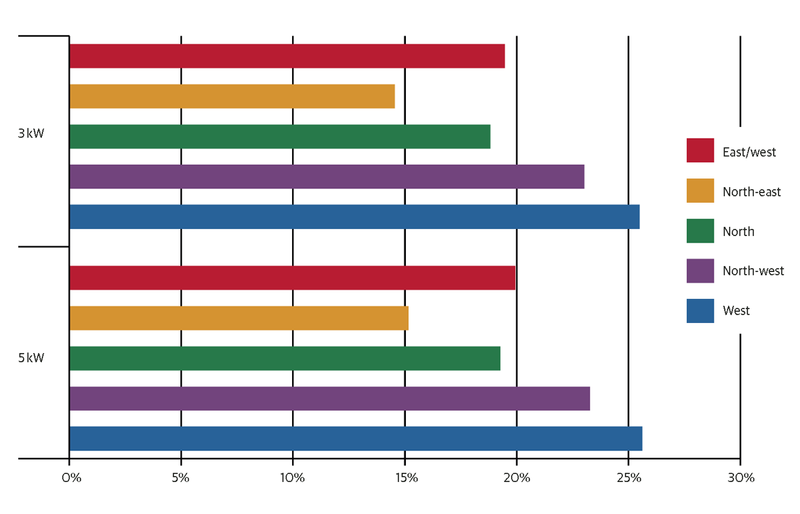 Note that although west systems get the greatest percentage increase in payments, total payments are still higher for north and north-west systems due to higher overall generation. So, will it be worth switching retailers? The first thing to consider will be the retail tariffs that are on offer. Extra feed-in tariff payments of $150/year won’t be worth it if you have to pay an extra $200/year for the power you buy from the grid. Assuming that you can find comparable retail tariffs, then switching to a retailer offering the time-varying FiT will be worth it—particularly if you have low electricity consumption, an oversized PV system or a number of west or north-west facing panels. Of course, some retailers may choose to offer a higher flat FiT (as already happens with the current minimum FiT), so we will revisit this when the new rates become available later this year. Keiran Price is an energy analyst at Renew, Renew magazine's publisher. This article was first published in Issue 143 (Apr-Jun 2018) of Renew magazine. 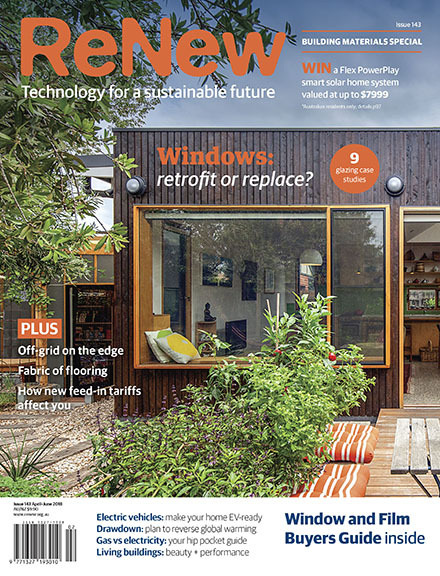 Issue 143 is our building materials special, including a window buyers guide and an article on flooring options.